when my head hits the pillow these days all i do is think, think, think, so i may as well put my nightowl tendencies to good use. 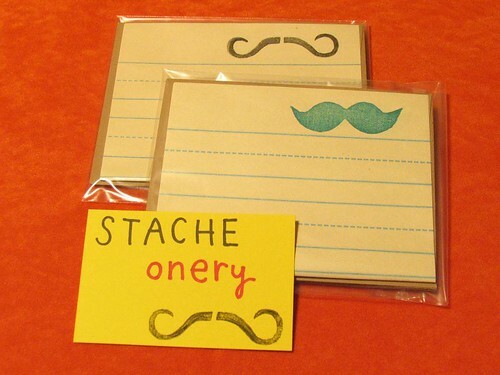 i finally FINALLY figured out a way to package up my mustache stationery AND thought up a clever name AND took pics AND listed sets on etsy. i attempted to google it and couldn't find anyone who had used my word play. i tried alternate spellings and everything. :D it feels good to accomplish craft goals well before my first craft fair of the year, depart-ment, and not have to rush to get everything done at once. i hear hoggle eating, which means i should get some sleep. tecalitlan tomorrow night @ 7:45. Current Music: i've had this los campesinos song in my head. Ha! That is the most awesome name ever. i hope you are making a lot of these because THEY RULE!!! i have a bunch of sets. so so so cute! you've scored again! great moustaches! just in time, i hear moustaches are IN for the season!! these were carved from rubber erasers, but all my cards i use the japanese printing press: the print gocco, which RULES!